Redesigned inside and out, the Intell iRoute TND 730 LM features new, sleek hardware, a faster processor, and updated graphics and maps, all on a large 7" screen. Truck Routing Customized for the dimensions of your truck. Set warnings for hills and sharp curves. Navigate complex interchanges with junction view. View current mile marker. Optimize trips with multi-stop routing. Truck Content and Tools Search travel centers by amenities. Find truck service locations, rest areas, restaurants, and millions of points of interest. Manage timers, mileage, and fuel logs. Set alerts for maintenance and warnings for hill, sharp curves, state borders, and more. Toll costs View estimated toll costs and compare routes without tolls. Advanced lane guidance Navigating through cities can be difficult. Be prepared for what's ahead, whether you're approaching a turn or heading through a complicated intersection. WI-Fi Connected Services Check weather, fuel prices, and traffic along your route. (Traffic sold separately on the Rand McNally Dock.) Video Input Connect your back-up or blind-spot camera and see the image right on your TND. 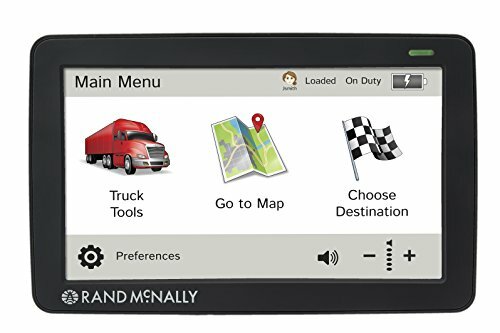 The Rand Advantage Benefit from 35% more truck routing information than other GPS units, Road Work construction updates, and cross-references to the Rand McNally Motor Carriers' Road Atlas. Lifetime Maps Get updates as long as you own the TND. Trip Maker Plan ahead with Rand McNally's online trip planner. Set via points and download to the TND as a multi-stop trip.